Israeli Prime Minister Ariel Sharon has authorised the construction of 1,000 settler homes in the West Bank. A cabinet official told AFP news agency the bids would be published after site inspections by the housing minister. The Middle East peace plan known as the roadmap specifies a complete freeze on settlement activity, but Israel insists the plan has backing from the US. The US avoided publicly criticising the announcement, saying it needed to study the plans closely before commenting. "We are studying the details regarding the tenders that have been issued by the government of Israel," said US State Department spokesman Adam Ereli. "Our concern is to determine whether these tenders are consistent with the government of Israel's previous commitments on settlements." Under international law, settlements in the occupied territories are illegal, though Israel disputes this. Correspondents suggest the move aims to defuse resistance to Mr Sharon's plans to pull out of the Gaza Strip. 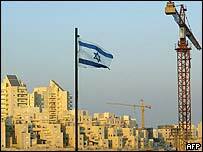 The BBC's Jill McGivering in Washington says the US seems unsure whether Israel's home-building plan is a real proposal or merely political posturing. The roadmap peace plan obliges Israel to stop settlement growth, while the Palestinian Authority must act to curb militant attacks on Israel. Chief Palestinian negotiator Saeb Erakat said the construction of the new homes would bury the roadmap. "This shows that Sharon has no respect for any of the commitments that he has given to President Bush to dismantle the outposts and freeze construction in the settlements," he told AFP. The Israeli Haaretz newspaper reports that the plan includes 604 homes in Betar Ilit settlement, 214 in Ariel, 141 in Maale Adumim and 42 in Karnei Shomron. The newspaper reports that Mr Sharon delayed announcing these plans last week under pressure from the US. The current plans do not include nearly 190 new settler homes that were to be authorised at Kiryat Arba and Geva Binyamin. A senior Israeli government official insisted the tenders were "within the guidelines of the government and the agreements with the Americans". Meanwhile, the US embassy in Israel has announced that an American delegation will visit Israel to inspect settlement activity. Embassy spokesman Paul Patin said the team was due to arrive next month to "monitor Israel's compliance with the roadmap". Correspondents say the US is frustrated over Israel's failure to dismantle all but a handful of 100 unauthorised wildcat settlements that have been established since Mr Sharon came to power in March 2001. The BBC's Jon Leyne in Jerusalem says, Mr Sharon's decision on the settlements comes just a day before he is due to face a tough meeting of his governing Likud party. He is under pressure because of his decision to withdraw settlements from Gaza and for engaging in coalition talks with the opposition Labour party. Our correspondent says many in Israel believe the announcements on the settlements may be a way of trying to appease his critics.